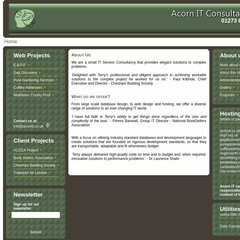 www.Acornit.co.uk - Acorn IT Consultants Ltd.
acornit.co.uk Acorn IT Consultants Ltd. - English BlackBall Pool Federation ..
Its 3 nameservers are ns1.ourwindowsnetwork.com, ns2.ourwindowsnetwork.com, and ns3.ourwindowsnetwork.com. It is hosted by Red Fox Uk Limited (England, Lancashire,) using Microsoft-IIS/6 web server. It is written for ASP.NET language. PING www. (89.238.132.205) 56(84) bytes of data.